This review compares last year's 2016 Old Farmer's Almanac seasonal precipitation and temperature forecasts for the winter period of November-March (NDJFM) 2015-2016 the observed temperature and precipitation anomalies for the same periods. 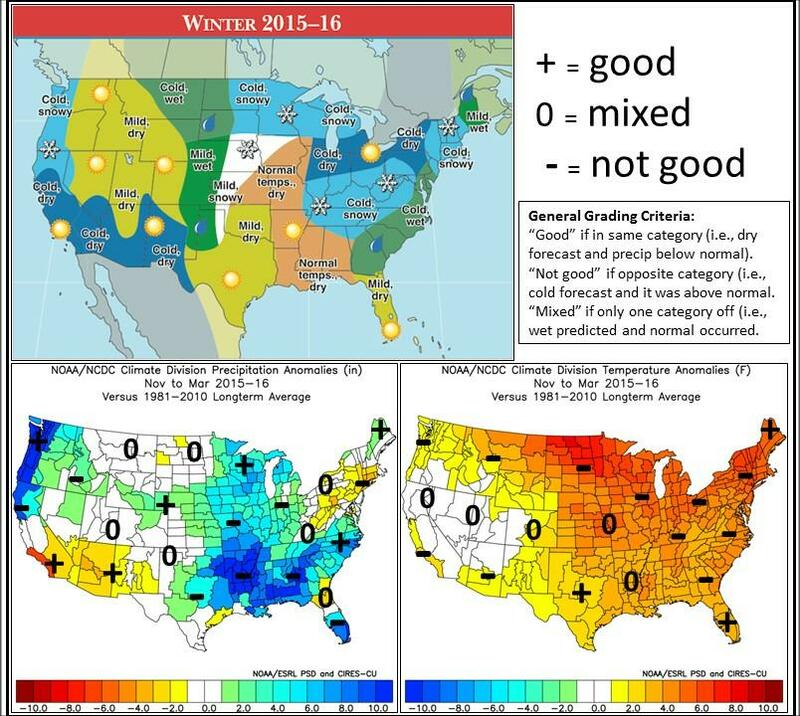 The Winter forecasts are reproduced from the 2016 Old Farmer's Almanac (Yankee Publishing, Dublin, NH) website and the corresponding observed temperature and precipitation data were downloaded from the Climate Diagnostics Center (CDC). My subjective graphical grading is below. Overall if a forecast was in the right category (i.e., above normal was forecast and above normal was observed) I graded it as "good". Conversely, if it was the wrong category (i.e., above normal was forecast and below normal was observed then i graded it as "not good". And if the forecast was off by a single category (i.e, above normal was predicted and it was normal) or there was a mixture of above and below in close proximity to one another then I graded it as "mixed". Of the 23 precipitation regions compared, I rated 7 (30%) regions as "good", 9 (39%) as "not good" and 7 (30%) as "mixed". Of the 19 temperature regions compared, I rated 3 (16%) regions as "good", 11 (58%) as "not good" and 5 (26%) as "mixed". However, I leave it to the individual reader to do their own comparison and evaluate the relative usefulness of the forecasts.